Kitchens are often considered the heart of the home. There are so many wonderful things that happen in your kitchen and so many beautiful pieces of cutlery and glassware. The only problem with this is having to store these treasures in shuttered cupboards, out of sight and, sadly, out of mind. That is where open kitchen shelves come in. Not only do open kitchen shelves make your life easier (suddenly you can see everything! ), but they also provide you with a stage to show off your favorite pieces of kitchenware, crockery, and decor. Open shelves mean the days of overstuffing and losing cups to the depths of the cupboard are gone. Instead, everything you need is within reach and easily in view. 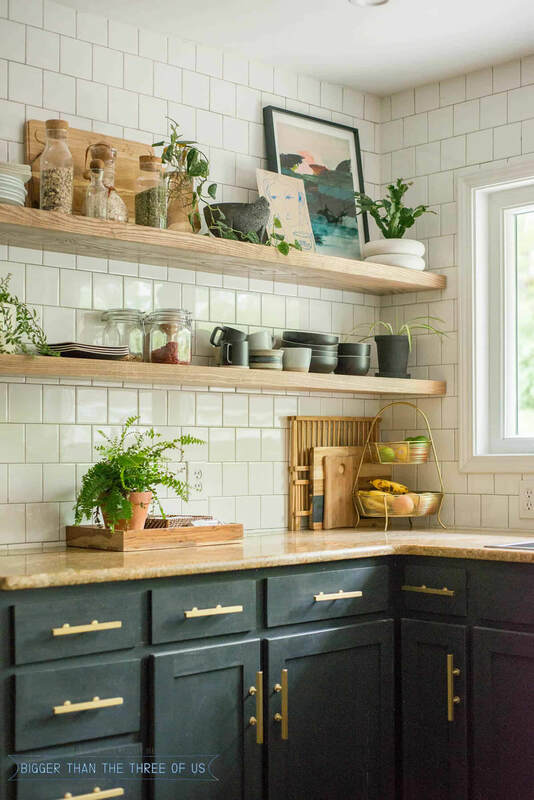 Whether you are refinishing an outdated kitchen or are looking to create more storage space in your home, these fresh takes on kitchen organization will open your eyes to the variety and ingenuity of open shelving. You’ve taken the care to curate a lovely collection of plates, glasses, and china. Why stow that away where no one can see them? Think creatively about how to put your kitchen set on display so that you and your guests enjoy it every day. If you want shelves that you can trust, these thick boards are just the ticket. With a bare natural wood look, they fit in with the modern farmhouse aesthetic and work well with multiple surface types and colors. As seen here, you can pair these versatile shelves with dark stains, light counters, and even tile. Shelves that come with angled support beams always exude a bit more confidence than those that are free floating. With triangular supports, you can see that your shelves are going to stay in place. Another great feature of these supported shelves is how easy they are to do at home. Consider creative uses for the angles like the paper roll seen here. One great thing about hanging open kitchen shelves instead of using cupboards is the fact that you have so much more say in the size, shape, and capacities of each shelf. Another obviously awesome feature is that you can use additional shelf space to decorate with your favorite succulent or piece of art. They are functional but leave room for creativity. 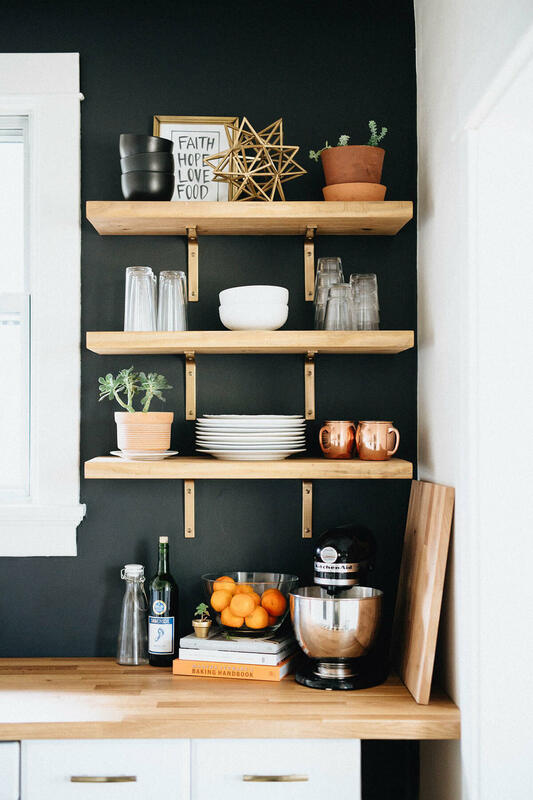 These perfectly sized and placed shelves take an otherwise useless nook and create a magical space for supplies, décor, and other kitchen essentials. 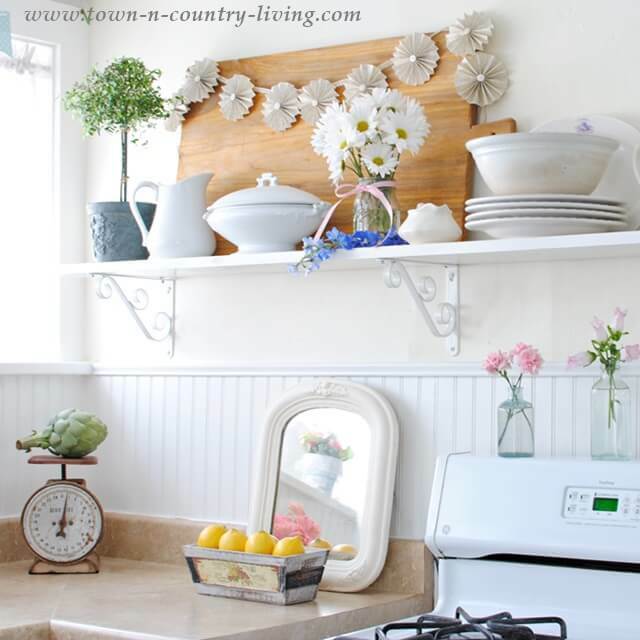 With a slightly weathered feel, these white shelves blend easily with a farmhouse chic look. If you decide to create these shelves yourself, you can play with how much distressing to use, and you might even consider colored paints. One of the best options for open kitchen shelves is using only the space you need. With a cupboard, every shelf is the same size leading to awkwardly stacked dishes and inaccessible rows. 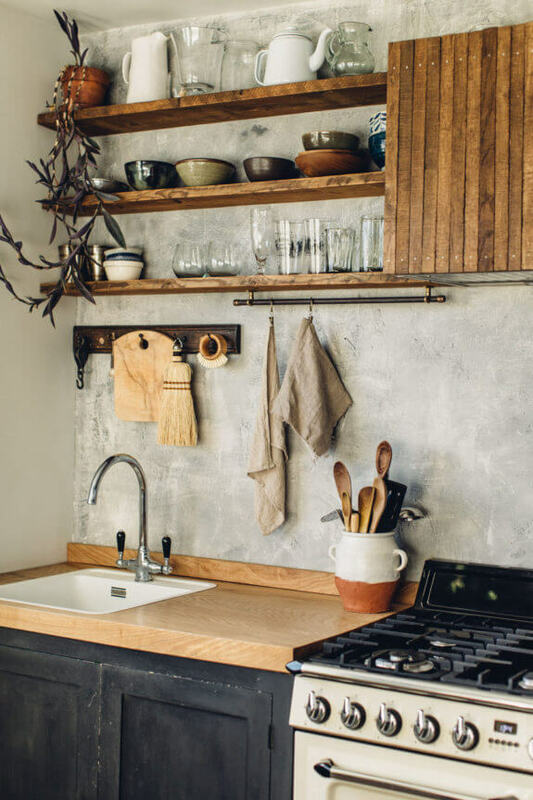 With open shelving, on the other hand, you have the flexibility to create shelving space that is just the right width for your dishes, glassware, or other kitchen essentials. Shelves like these are perfect for when you wish you had just a little more space. With the addition of these short but solid shelves, you have created several extra feet of surface space for décor and storage that otherwise would have gone unused. When you decide to use shelving, you begin to see that options for open storage are endless. If you are looking for a shelving option that blends into your home and makes a modern statement, then this cool piping option is a great choice. Built on copper pipes that not only create the shelves but also integrate into the ceiling décor, these shelves appear naturally placed and very chic. 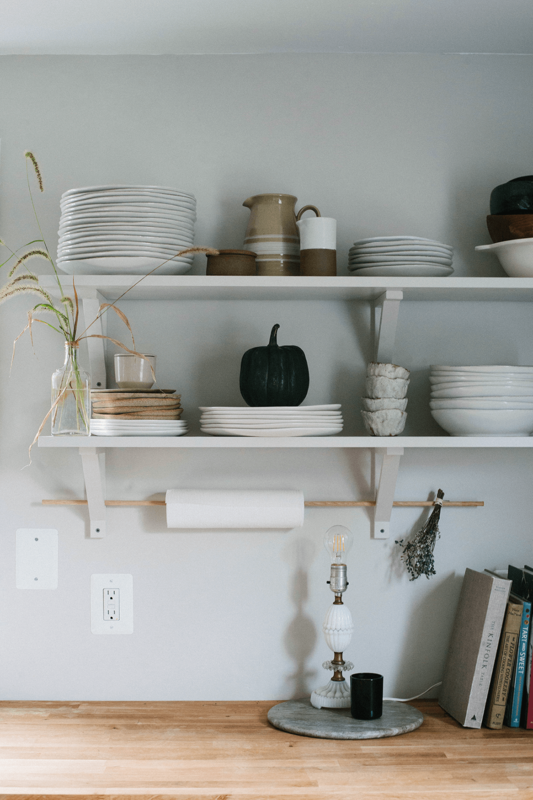 Harkening back to the days of yore, these cool rounded shelves sit elegantly above the sink and are best used for things that will make you happy while washing dish after dish. 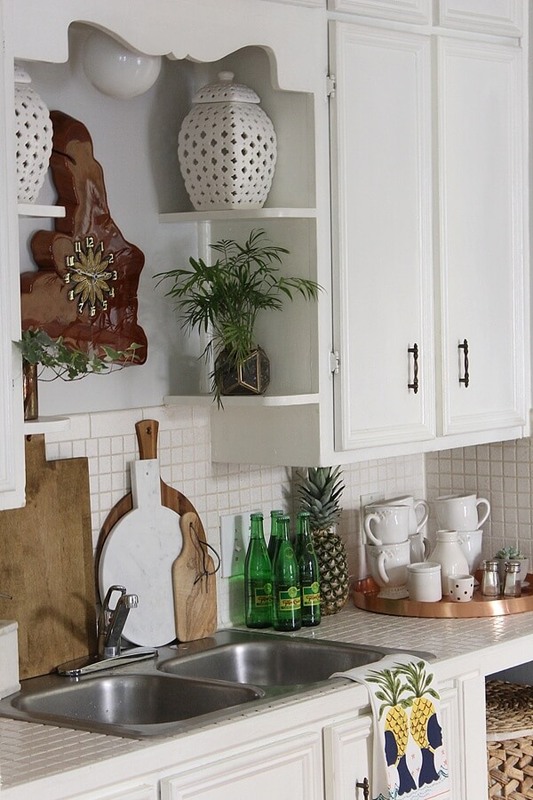 Adding character to any kitchen, these open shelves are great for holding your favorite plants or knick-knacks – or maybe just your dish soap, if that’s what you prefer. 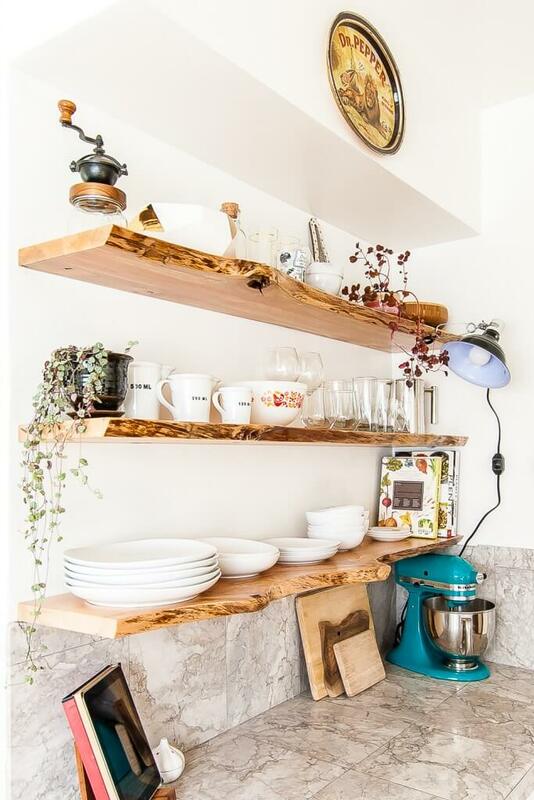 If you are looking for gorgeous open kitchen shelves, then these rustic yet manicured natural wood shelves are a great option. Maintaining the elegant natural curve of the wood, these smoothed down shelves are both decorative and functional. When using such an authentic and woodsy option, be sure to add living plants to accentuate the beauty of the bare timber. 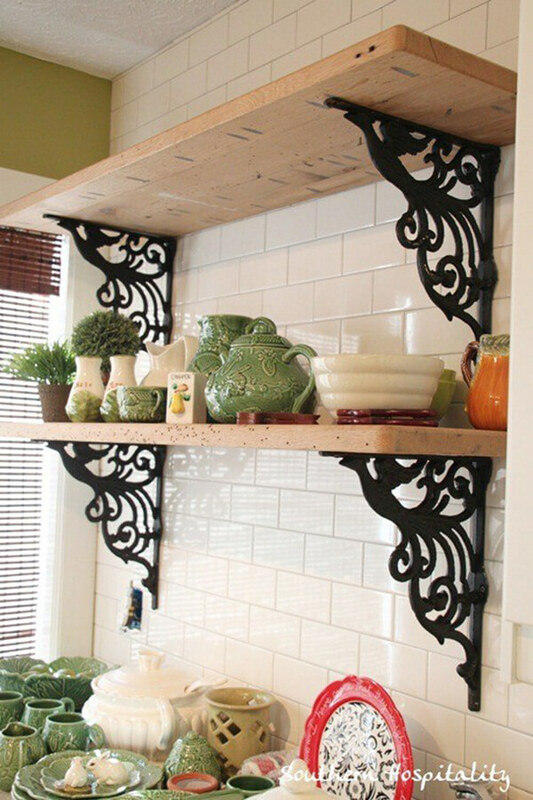 These wide shelves rest confidently on gorgeous black iron braces. Choosing an option such as this gives you the reliability of a stable shelf but with a lovely decorative touch. This option is great for homes with a vintage vibe and can be mixed and matched with different colors of wood or iron to suit your home. Open kitchen shelves work great for when you want what is on your shelf to stand out. However, they can also be smartly used to provide the ease of open shelves while maintaining decorative discretion. These floating shelves blend so well with their brick stone background that, boasting mostly clear glassware, they nearly disappear. Placed in that special nook above a buffet or side table, these shelves embrace the farmhouse aesthetic and offer lots of storage while occupying minimal space. Although you may need to pull out the step stool to get to the top tier, these shelves can hold anything and add many feet to your storage and decorative space. 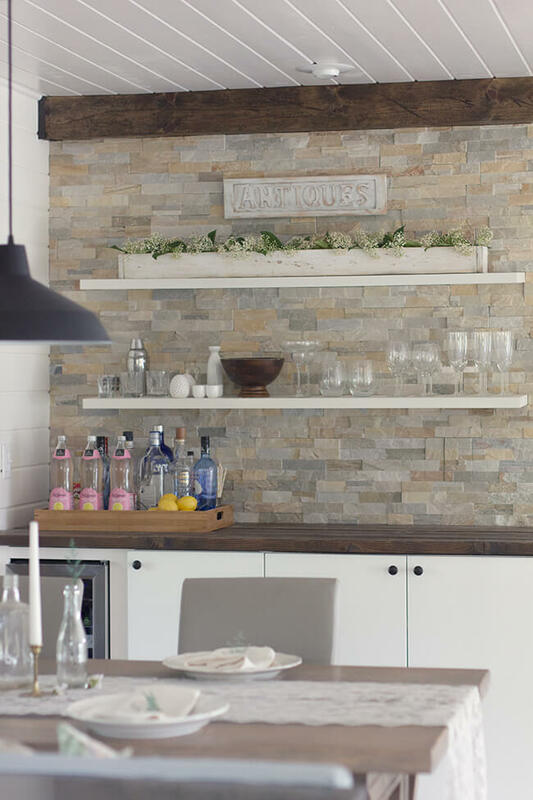 These simple and slim flat white shelves are such a natural choice for the kitchen. Bright whites always brighten up space, and adding shelves in this color will give life to everything you place on them. The inclusion of the classically curled iron supports provides structural stability while adding character. If you are wanting to maximize your space, then corner shelves are a great option. 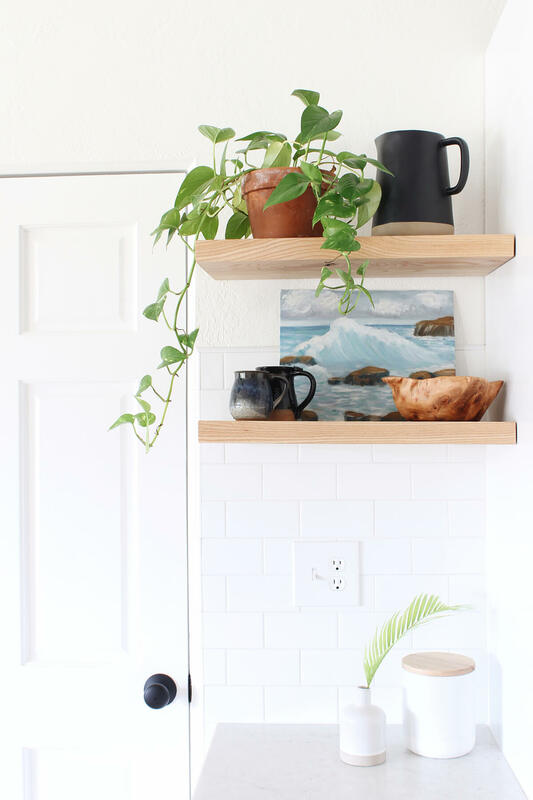 Usually, there are not many choices for corners besides the hanging basket or plant, so a great way to liven up that often overlooked space is with lovely shelves, both for storage and for a gentle place to set that houseplant. When you find yourself with an open wall, it feels like there are endless possibilities. One of the best options is to add helpful shelves. 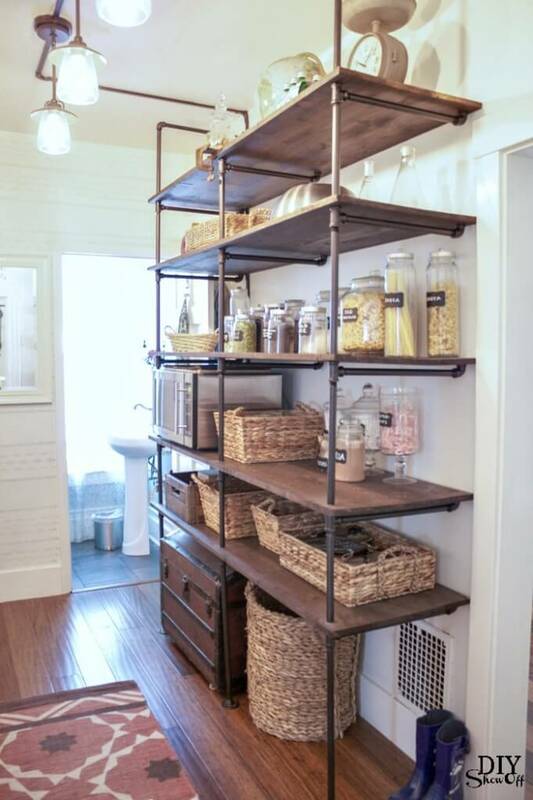 This creative shelving idea combines two rows of traditional shelves on top but then adds fun and creative basket shelving below for country store charm and convenience. 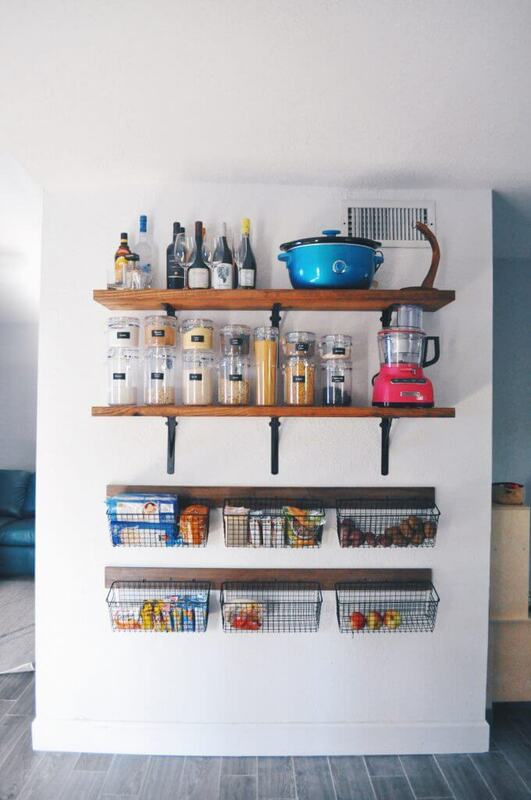 Shelves, while often practical, can certainly be used just for fun. This adorable repurposed Coke box makes for a great shelf for your favorite mini succulents and another petite décor. 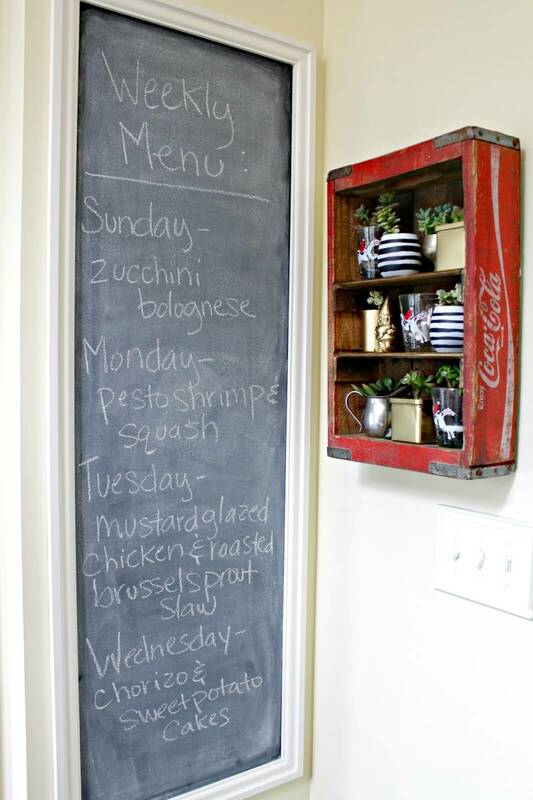 Place this in your kitchen with your favorite items to brighten everyone’s day. Simply find your favorite vintage box, turn it on its side, screw in a few shelves, and voila! 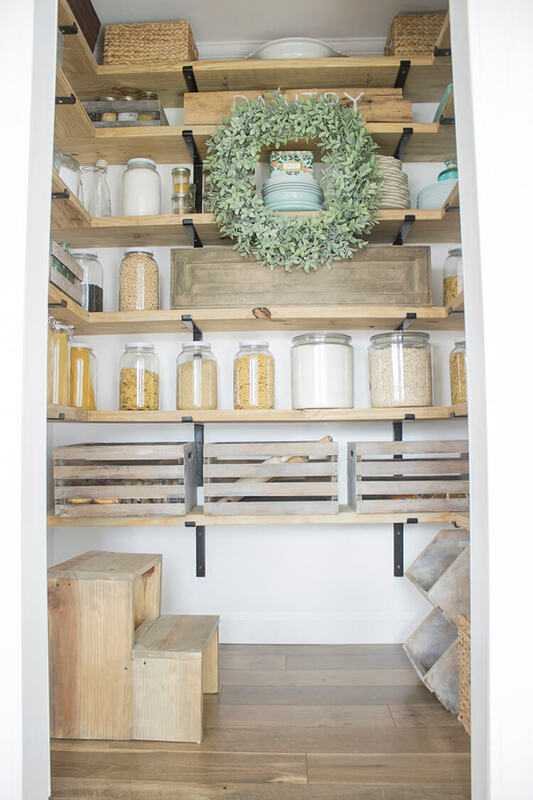 Anyone can appreciate the beauty of a well-organized pantry. 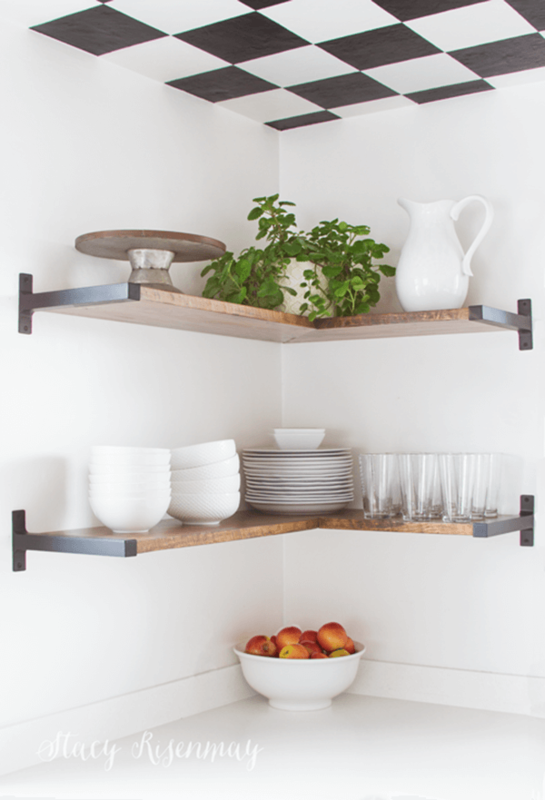 With these clean and simple shelves, you will feel inspired to create for yourself an easy and organized space. 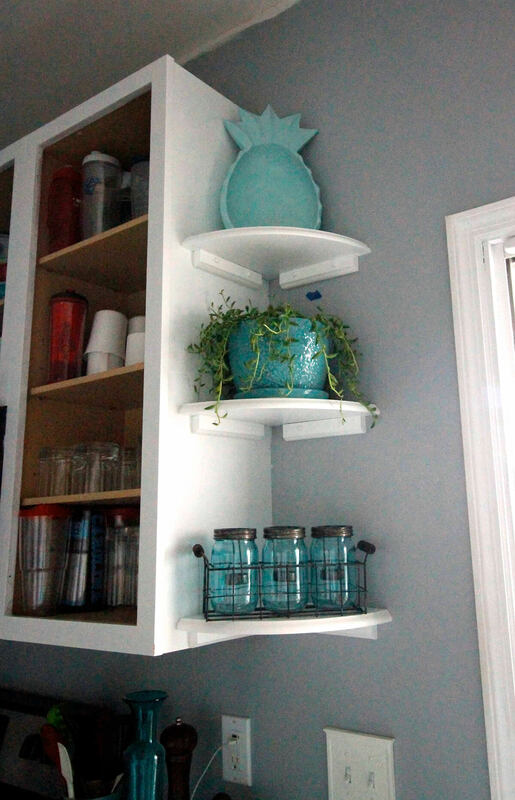 Stretching from the floor to the ceiling, this approach allows you to store everything from cereals to dinner plates. Just be sure not to forget your equally adorable step stool for top-shelf access. When your cupboards end, you can be left with miles of bare wall space. Why not fill that space in with lovely curved corner shelves? 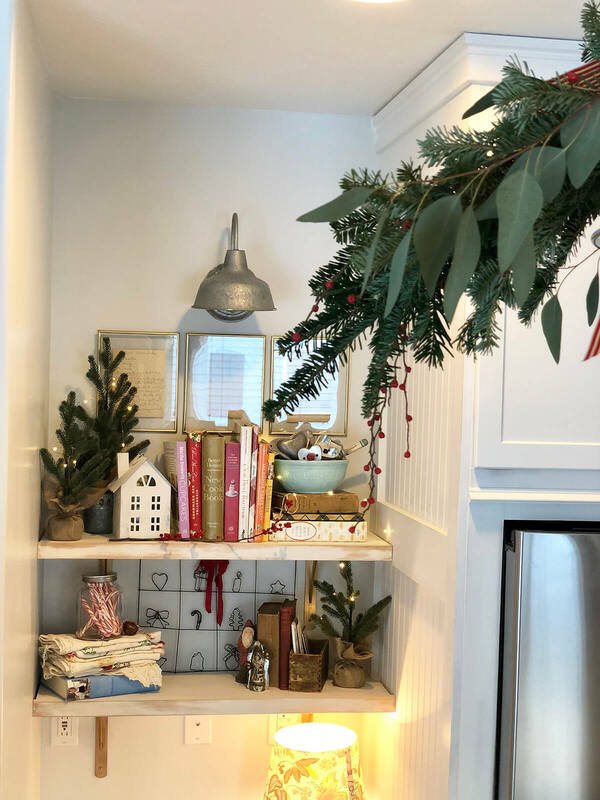 Adding three shelves between the side of the cupboard and the wall is not only easy, but it adds so much to the look and feel of your kitchen décor.